Murdanda, a sleepy village about 30 kms from the restive Bijapur district in Bastar, wears a deserted look. The village is not forsaken because of Maoist terror; people have left their homes for forests to collect the produce - their livelihood and major economy. This is not the only village; a major part of interior Bastar wear a similar look. The villagers leave the settlement at dawn and return only after dusk. It is the peak season for minor forest produce collection that has soured the election flavour in the constituency where rebels normally call for poll boycott. 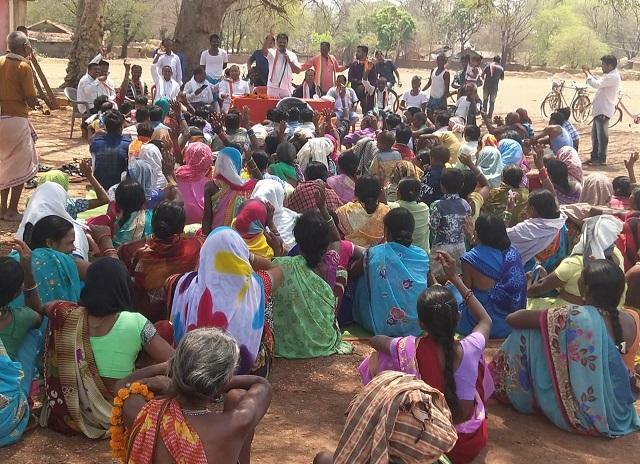 The candidates visiting villages in the interior part of Bastar, which goes to polls in the first phase of election on April 11, are in a fix. Despite informing in advance, tribals are not staying in the village; giving work top priority. And why not! After all, the minor forest-produce business is worth around Rs 2,000 crore a year in Bastar. Besides government-run societies, tribals sell their produce in 'haats' - the village weekly market considered the lifeline of tribal culture and tradition in Bastar. The private traders from neigbouring Telangana purchase the produce and the transaction is in lakhs. For the last fortnight, haats have been abuzz with political activity. Failing to find inhabitants in their homes, candidates are now targetting people in the haats. Tribals in Bastar make it a point to visit the haat. They travel as much as 20 km to the haat where they bargain, exchange and shop for their needs. Besides, it is also a platform for people to meet relatives, who live in adjoining villagers. “The haat is the main centre of the election campaign and all political parties in the fray have put their stalls in the market,” said Rajendra Vajpayee, a political observer in Bastar. People attend meetings in the market and return to their village where they communicate the message of political parties by holding choupals (village meeting), he added. However, the festive look, common during elections, has vanished from Bastar where Congress is desperate to regain the seat. The party held the seat last in 1991. The change of face in BJP has, however, given an upper hand to the Congress that has pitted its sitting MLA Deepak Baij against BJP’s two-time legislator Baiduram Kashyap. BJP stalwart late Baliram Kashyap and his family hold considerable sway in Bastar. For the last six terms, they have retained the seat. BJP denied ticket to sitting MP Dinesh Kashyap and fielded the candidate who is not a popular face as his Congress rival. Political observers feel that even BJP is not taking the constituency seriously. Prime Minister Narendra Modi visited Jagdalpur - the divisional headquarters of Bastar - twice during the campaign. But for a transit halt at the airport, he did not attend any election show in Bastar.